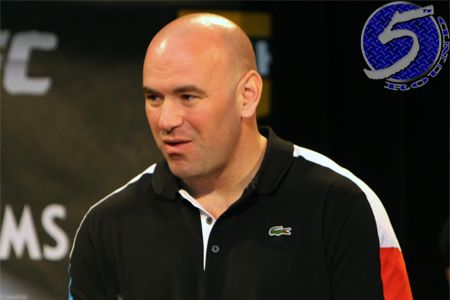 Despite swallowing up his biggest competitor and landing an ever-elusive broadcast network deal with FOX this past year, AskMen’s readers voted UFC president Dana White (Pictured) as the 38th most influential man of 2011. For a mixed martial arts representative to crack the Top 49 list is an accomplishment in itself, however White was rated #32 in last year’s poll and #9 in 2009. UFC welterweight king Georges St-Pierre is the only other MMA star to ever make the club. GSP was ranked #36 in 2009. After tallying over 200 thousand of their reader’s votes, it was determined Apple’s late CEO, Steve Jobs, was the year’s most influential man. Rounding out the top five were; Seal Team Six, followed by Larry Page, Warren Buffet and Kanye West. Oddly, Facebook founder Mark Zuckerberg was pegged at #27. That’s interesting considering that more than 800 million people across the globe use his product on a regular basis.